BAM! MEGA64 VERSION 1 SPECIAL EDITION COVER AND DETAILS REVEALED! BOOM! PODCAST 73 RELEASED! All five full half hour original Mega64 public access episodes! Original 2003 Audio Commentary on each episode! The DVD goes on sale Thanksgiving weekend, on Black Friday! Start lining up in front of your computers NOW!! 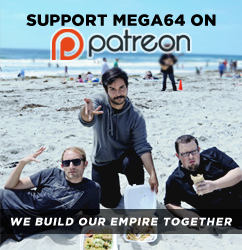 In case that information isn't enough of an overload, here's the Mega64 Podcast Episode 73. We talk about the new DVD, our "Little Big Planet" video on IGN, Dreamseller, the election or whatever, and Shawn and Garrett losing their right to marry. Watch below or subscribe to the left. Audio version here. Don't forget that we're on SpikeTV this Friday night! Tune in to "Gametrailers TV" at 1AM for some Mega64 fun, and then come back here to see what might be the best Mega64 video ever! You have to see it to believe it!